“Mamabono” is pro bono program for mothers to join during their maternity leave or off the job. They support NPOs and citizen groups on 2-months projects. 4 projects are held with 24 participants in Osaka, and 10 projects in Tokyo with 71 participants. In addition, 6 participated in the “Mama-team” on “Pro Bono 1 DAY Challenge” in Tokyo, and 1 team is held in Aomori with 5 participants. In total, 106 mothers joined Mamabono projects in 2018. 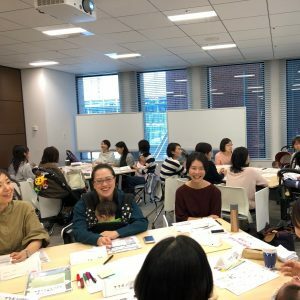 On Oct 11th, Osaka Mamabono projects have their first meeting all together. Most of the participants hold their babies in their arms even during the discussions. Mamabono participants enjoy the projects to utilize their business skills, networking with other working mothers, and contributing to society, and prepare to return to work after their maternity leaves. It brings the total participants to 329 and their babies.